Mumbai's Juhu beach is strewn with trash at low tide during monsoon season. Floodwaters flush garbage out of the city and into the Arabian Sea. As tides ebb, beaches are blanketed in trash, much of it plastic. Volunteers and some municipal workers carry buckets of trash to a bulldozer on Mumbai's Versova Beach. Three years ago, a lawyer who lives near the beach, Afroz Shah, started a cleanup campaign on Facebook and Twitter. At Mumbai's Versova Beach, dozens of volunteers show up several times a week to rake up trash. Boys play as cows graze through garbage at the Deonar landfill in Mumbai. Milkman Chiman Singh refrigerates milk, yogurt and cheese in metal barrels at his dairy shop in Mumbai's Juhu market. He used to sell these items in plastic bags. But the Indian state of Maharashtra has banned plastic packaging so customers must bring their own containers. Singh says he's lost more than half of his business since the ban took effect on June 23. It's easy to see the scope of the problem. Joggers, fishermen and families out for a weekend stroll on the waterfront have to clear a path through ankle-deep garbage. Three years ago, a lawyer who lives near Mumbai's Versova Beach decided he'd had enough. "The culture of using and throwing away is dangerous. For example, plastic straws. You don't need plastic straws in your life! 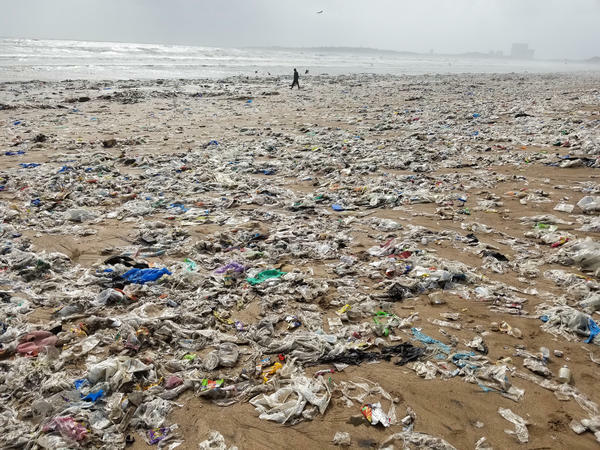 They create havoc in a marine environment," says lawyer Afroz Shah, who launched a cleanup campaign on Facebook and Twitter. I visited Versova Beach last week and saw about 50 volunteers picking up trash – at 7 a.m. on a weekday, in the rain. Among the items raked up and deposited into idling dump trucks: plastic soda bottles, empty chip bags, old sandals, toothpaste tubes, plastic bags — and many, many plastic straws. "Yesterday we picked up maybe 5,000 plastic straws in a patch of half a kilometer," Shah says. This spring, his group managed to haul away so much trash from Versova Beach, in northern Mumbai, that turtles were spotted hatching in the sand. For his efforts, Shah was recognized by U.N. Environment as its 2016 Champion of the Earth. 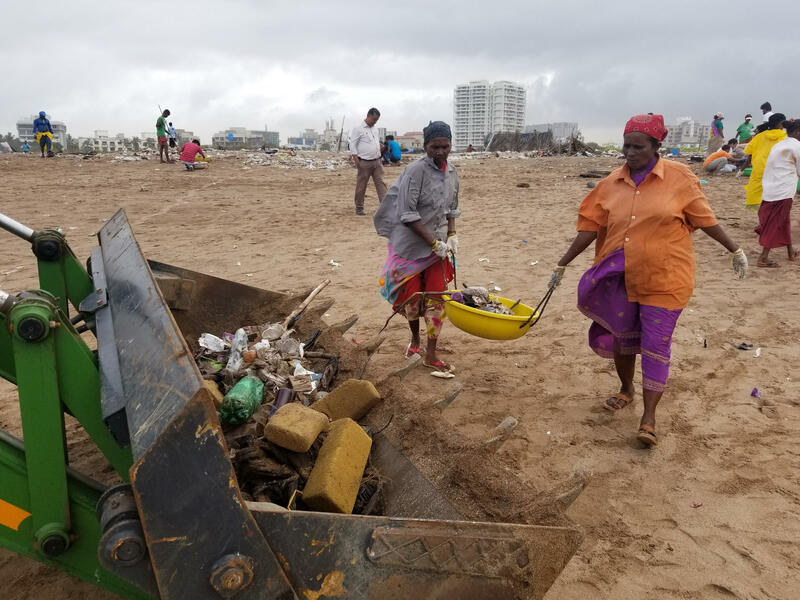 While volunteers clean trash from Mumbai's beaches, authorities are going to the source: The Indian state of Maharashtra, where Mumbai is the capital, has banned plastic packaging — bags, Styrofoam, takeout containers, even cutlery. The goal is for all of India to do the same by 2022. While other states and municipalities in India – and around the world – have banned single-use plastic bags, Maharashtra's ban is one of the most far-reaching. The state government has issued detailed guidelines for what's legal and what's not. Plastic medicine bottles and rainproof tarps are OK; those colorful plastic garlands that frequently adorn Hindu temples are not, any longer. Plastic waste isn't just an eyesore on Mumbai's beaches. It's a public health issue. 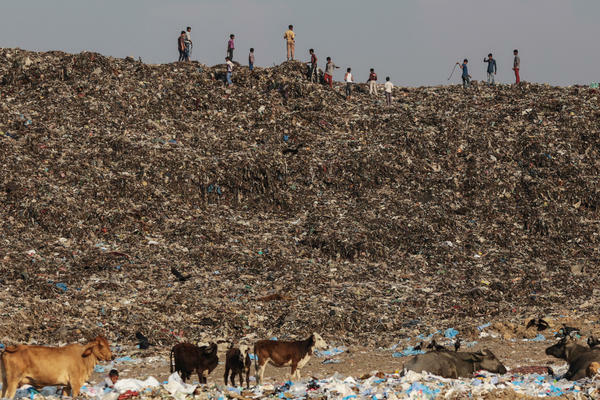 The Deonar dumping ground, in eastern Mumbai, is one of Asia's biggest garbage dumps. It's the size of 200 football fields and it sometimes catches fire. "I feel the stench ... Sometimes we can see the smoke, too. When plastic burns, it's carcinogenic. Fire breaks out on a dump that is not treated well," says Vandana Trivedi, who lives near the Deonar dump. A mother of two, Trivedi moved to Mumbai 10 years ago to work in finance and has become an anti-garbage activist. Indians actually consume only about a tenth of the plastic that Americans do per capita. But waste management lags behind. There is recycling, but it's mostly informal. The poorest of the poor sort trash by hand, physically atop the dump pile. Trivedi says this plastic ban is great PR for India, but she worries it could be watered down as businesses lobby the government for exceptions. Already authorities have given e-commerce companies three extra months to comply and have ruled that fishmongers will be allowed to keep using foam containers to keep their fish on ice. "It will make no difference to the [trash] heap [near my home]. I think someone in the leadership of the government wanted to do something catchy in terms of headlines," Trivedi says. "Where is the education?" 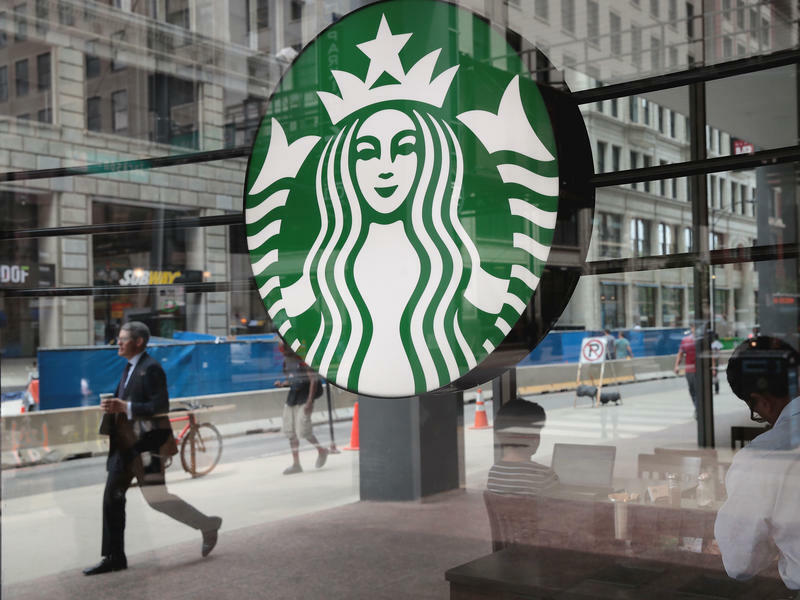 Most businesses are scrambling to comply or face fines of $70 and up — and jail time for repeat offenders. At his dry cleaning shop in northern Mumbai, Sunil Srivastava operates a conveyor belt hung with freshly pressed shirts covered in sheer plastic. When the plastic ban took effect on June 23, he began delivering clothes wrapped in paper, which costs him more and doesn't hold up quite as well in the monsoon rains. A few doors down, there's a dairy shop that used to sell milk and yogurt in plastic bags. 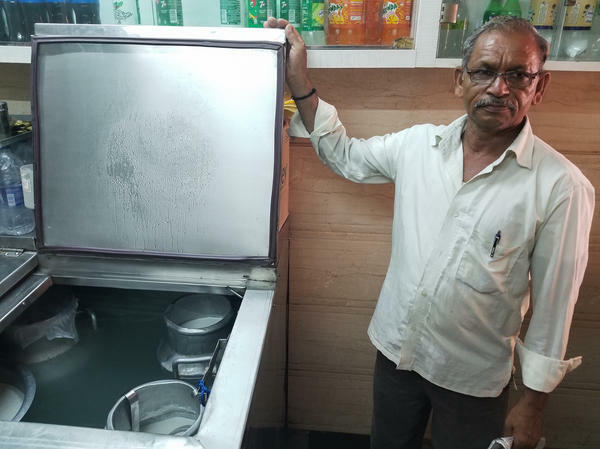 "Now the customer has to bring the container," explains milkman Chiman Singh, opening a big metal refrigerator to reveal huge metal barrels of milk, yogurt and cheese. "Before the ban, people used to drop by on their way home from work." Now more than half of the customers leave without buying anything, he says. "There's nothing we can do. It's a little inconvenient." Stuffing a cloth bag in your purse is one thing. But who wants to carry around an empty milk bottle? At a fruit and vegetable stand across the street, another shopper surveys the mangos, a reusable cloth bag in hand, and wonders whether a country as large — and as poor — as India, can pull this off. "There are 1.2 billion people living in India," says shopper Sheru Mann. "How can you change the system?" She says she hopes this ban is a start. India's largest city has banned plastic bags and packaging. In India, people actually produce only a tenth of the plastic waste that Americans do. The problem is where it ends up, as NPR's Lauren Frayer reports from Mumbai. LAUREN FRAYER, BYLINE: I'm trying to go for a morning jog on my local beach in Mumbai. It's dawn. There's a little bit of a drizzle. But I've got to literally clear a path through ankle-deep plastic trash, and the problem is particularly bad in the monsoon season right now. AFROZ SHAH: See, because monsoon, the waves and the tides are on the higher side, lot of water enters into the creek, and these creeks are full of plastic. 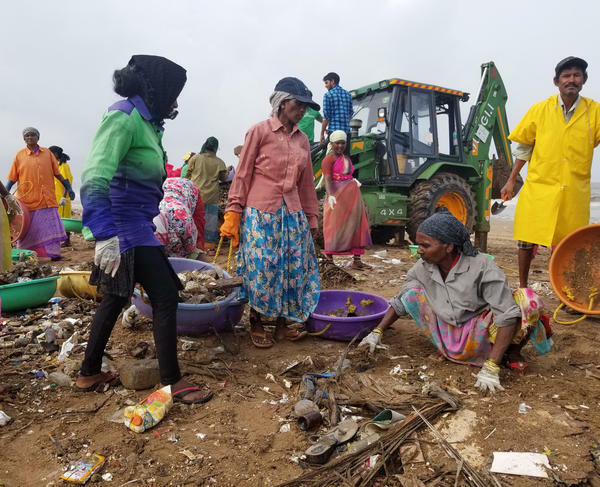 FRAYER: Afroz Shah is a lawyer who got sick of watching floodwaters from Mumbai's creeks flush trash out into the ocean and then up onto his local beach, so he launched a cleanup campaign on Facebook and Twitter. Today, there are about 50 volunteers here. UNIDENTIFIED PERSON #2: We find shoes laying around. UNIDENTIFIED PERSON #3: Packagings - that's what we're finding the most. FRAYER: As volunteers pick up trash, authorities are going to the source. The Indian state of Maharashtra has banned plastic packaging - bags, Styrofoam, takeout containers, even cutlery. The goal is for all of India to do the same by 2022. Plastic waste is a public health issue, says activist Vandana Trivedi, a mother of two who lives near one of Asia's biggest garbage dumps here in Mumbai. It's the size of 200 football fields, and it sometimes catches fire. TRIVEDI: Where is the education around the whole thing, right? People are clueless as to what is banned, what is to - not banned. FRAYER: Nevertheless, stores are scrambling to comply or face fines of $70 and up and jail time for repeat offenders. Dry cleaner Sunil Srivastava covers freshly pressed shirts in sheer plastic. FRAYER: But he now has to remove it before delivering to customers. FRAYER: So you will put this paper on the clothes now. FRAYER: But the paper costs him more, and it falls apart in the rain. A few doors down, Chiman Singh used to sell milk and yogurt in plastic bags. FRAYER: This is the milk in these big metal barrels. FRAYER: Yogurt and milk. So I have to bring my own container. FRAYER: He says he's lost about half of his customers. Stuffing a cloth bag in your purse is one thing, but who wants to carry around an empty milk bottle? At a fruit and veg stand, Sheru Mann fills her cloth bag and wonders if a country as large and as poor as India can pull this off. SHERU MANN: There is 1.2 billion people living in India. How can you change the system? FRAYER: I guess they're trying to start with this ban, right? MANN: Hope so. Hope so. Hope so. FRAYER: Lauren Frayer, NPR News, Mumbai. (SOUNDBITE OF BONOBO SONG, "KERALA") Transcript provided by NPR, Copyright NPR.